1. Glacier View (4 miles RT; 900 ft elevation gain) – Wow what an ending. This is the kind of hike that rewards you for your hard work. The 4-mile round trip trail is completely worth it for the unobstructed up-close view of Mount Rainier at the end. This trail has a little bit of elevation gain but not enough to make you want to turn around. The trail is easy to follow but can get tricky after a long snowy winter. 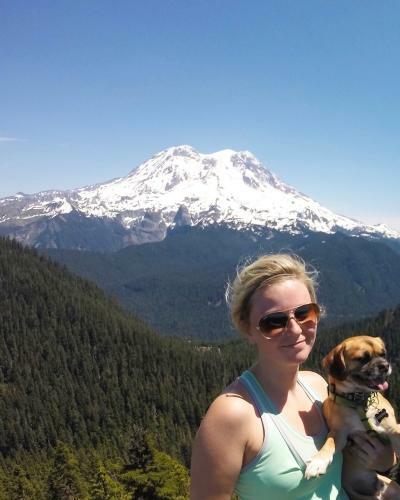 The trail stays just outside of Mount Rainier National Park making it completely dog friendly. 2. Sequalitchew Creek (3.0 miles RT; no elevation gain – This trail is located in DuPont right next to city hall. 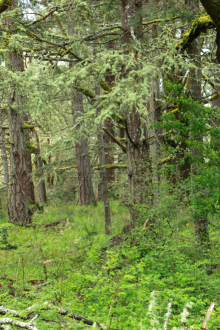 The magically green forest is mesmerizing as you begin this hike. Eventually you land on the gorgeous waterfront of the Puget Sound. This 3-mile round trip hike is very family and dog friendly. 3. High Rock (3.2 miles RT; 1,362 ft elevation gain) – This hike takes a bit of driving to get to and at times the drive can be a slow bumpy one, but I promise it’s worth it. This is a nice short hike with just enough elevation to give you a good workout. 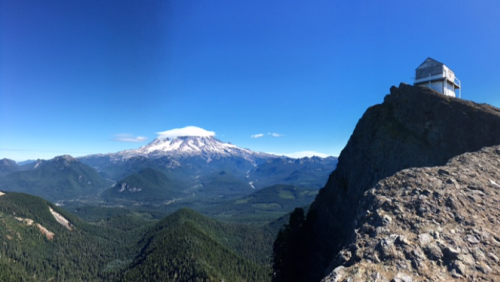 At the end of the hike you will arrive on a cliff edge with gorgeous sweeping views of Mount Rainier and the surrounding area. Be careful with your dog at the end of this hike as there are sudden steep cliffs and near the fire lookout broken glass. 4. 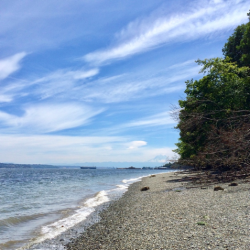 Owen Beach (2.2 miles RT; no elevation gain) – If you’re looking for something not in the mountains but still incredibly scenic, Owen Beach is your hike. Owen Beach is located inside Pt. Defiance Park and is accessible even when the 5-mile scenic drive is not. You can walk along the beach with your furry friend and often spot eagles and sea-life. There’s no elevation gain here but you are walking in sand so while it’s easier than most there is a little added difficulty. On a clear day, the view of Mt. Rainier is stunning. 5. 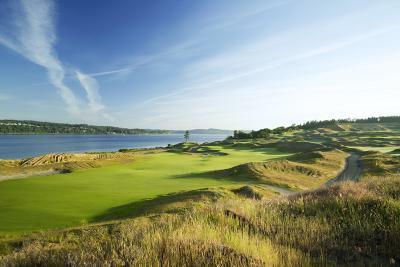 Chambers Bay Loop (3.25 miles RT 315 ft elevation gain) – The 2015 U.S. Open was held at this golf course and here you can relive those exciting times by taking a walk with the dog around the course. There is a great paved path that runs the 3.25 miles around it. The course is beautifully set on the water so there is plenty to look at. This trail for the most part is easy until you realize that 315ft elevation gain happens all at once. A nice feature to this trail is that there is an off-leash dog park along the way, it’s a great spot to let the dog play while you take a short break. 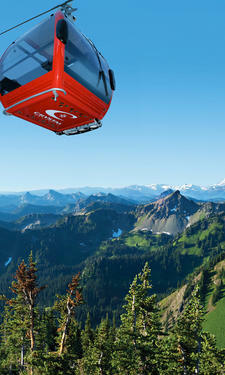 The Mount Rainier Gondola takes visitors up more than 2,000 feet to the summit of Crystal Mountain, where there are spectacular views of the mountainside and Mount Rainier in the near distance. One of the lesser-known secrets about the gondola is that it&apos;s pet-friendly and pets ride free. While during the winter, the snowy summit might make for cold paws, during the summer, the gondola provides access to all kinds of hiking trails at the summit and down the sides of Crystal Mountain. If I missed your favorite dog-friendly hike in Pierce County please let me know. Happy hiking!